Retail sales having been rebounding since poor December numbers released. XRT provides a way for investors to get exposure to consumer discretionary or retail sector. 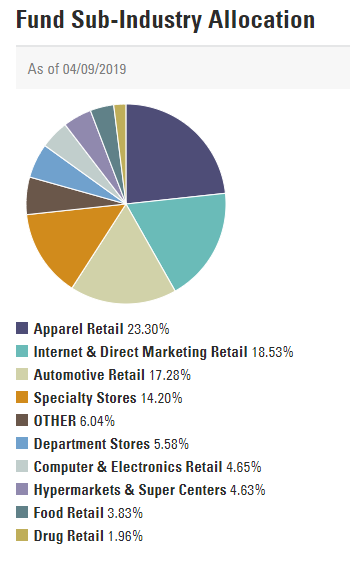 E-Commerce has disrupted the retail space with in-store retailers struggling to keep up. Retail performance is generally thought to be quite cyclical. There is the typical Christmas season surge in retail sales and periods of highs and lows in between. In an economy where almost anything can be purchased online through platforms like Amazon (AMZN), the retail environment has changed dramatically over the last decade. E-Commerce is flourishing and disrupting the retail space and traditional brick and mortar players need to adapt. Per this CNBC article "U.S. retail sales unexpectedly rose in January, lifted by an increase in purchases of building materials and discretionary spending, but receipts in December were much weaker than initially thought." This was good news but article continued to discuss how the December retail sales figures were adjusted downward from a decrease of 1.2% to 1.6%. This was the worst retail sales showing since September 2009, around the time when the economy was recovering from recession. (Source: US retail sales edge up in January, but December is revised sharply lower). Currently, the S&P 500 is nearing all-time highs, and many retail names have been along for the ride. This SA article also highlighted some of the recent retail trends in the market. The article reiterated that online non-store retailers continue to do well and are growing, which does not come as a surprise. 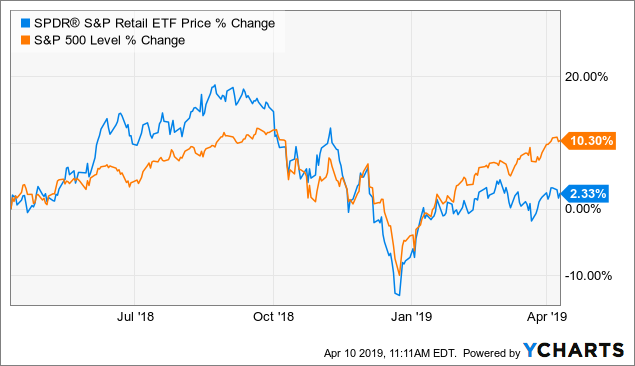 The SPDR S&P Retail ETF (XRT) provides exposure to the retail sector for investor who wishes to be long this basket of consumer discretionary companies. In this article, we will break down the characteristics of the fund, who the fund is suitable for, and some reasonable investment alternatives. 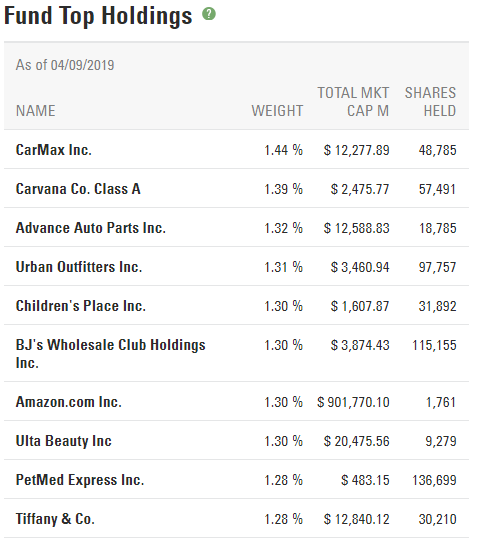 The SPDR S&P Retail ETF XRT holds several big names as a part of their top ten holdings and some other more unknown companies as well. This portfolio composition reveals that the fund does have some concentration risk in the apparel, Internet, automotive and specialty sectors, which make up approximately 73% of the fund. XRT's three year performance chart is provided below. The performance of the S&P 500 has been added for comparative purposes. As shown above, XRT has trailed the S&P 500 almost by almost 8% total return over the preceding three year period. Allows investors to take strategic or tactical positions at a more targeted level than traditional sector based investing." XRT is a good way to get exposure to the consumer discretionary sector if that fits your portfolio goals. XRT is not really appropriate as a sole investment on its own but rather complementing a balanced portfolio. It does provide some diversification from the core U.S. market as evidenced by its return against the S&P 500. Given that there are only approximately 90 companies in the fund, there will be inherently more sector specific volatility than a broad based index fund that tracks the S&P 500. If you are bullish on the future of online platforms like Amazon or eBay (EBAY), these names are only represented as approximately 1% of the total holdings of the fund. XRT also has penny wide option spreads available in both the weekly and monthly duration time periods. Per State Street, the fund has an expense ratio of 0.35% and the current net assets of the fund are $25.2 billion as of April 10, 2019. At the current net asset level of the fund, Vanguard would be earning approximately $75M annually for managing the fund. Some alternatives to XRT are provided below. There are considerable differences between the three ETFs based on number of companies, type of holdings and fees. IBUY differs from XRT most notably in its 27% exposure to non U.S. companies and its focus on online and virtual sales companies rather than traditional in store type business. There are 41 holdings in the fund and the expense ratio is 0.65% as of December 31, 2018. No one company comprises more than 5% of the fund. The SPDR S&P Retail ETF XRT could be suitable for complementing a balanced portfolio if the investor was bullish on the sector. If you are more bullish on the continued disruption of in-store retailer through the rise of E-Commerce, than this ETF would not be recommended as an investment. The other two ETF alternatives would be appropriate if more exposure to online sales was desired. Ultimately, XRT is an effective way to purchase a basket of U.S. consumer retail or consumer discretionary type companies in a simple and cost effective manner.